Trees are an environmental danger to your fence, but you can learn how to manage and prevent potential damage. 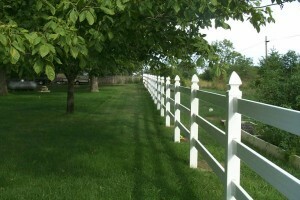 A good fence is an investment, and if you take care of it and keep it well-maintained it should last you a long time. However, you may still find that Mother Nature has other plans for your fence, no matter how well you maintain it. Environmental dangers to your fence abound, but you can take some steps to minimize the risk of a costly repair or replacement. No one would argue that trees are, on the whole, beneficial to the environment. Yet trees can also wreak havoc on your fence. A falling limb or toppled tree can easily do some serious damage to your fence, making you wary of any news of storms with heavy winds. To minimize this risk, take care to keep your trees’ branches trimmed and address any broken or diseased limbs promptly. Tree roots are another environmental danger for your fence, this time coming from below instead of above. Roots will sometimes grow above ground if there are nutritional deficiencies in the soil or if the fence posts are deep enough to disturb them. If the roots grow underneath your fence, they could cause it to start buckling. Consult a licensed arborist to determine the best course of action for this situation. Tree sap can also drip onto your fence that, while not posing a structural danger to your fence, can be unsightly and difficult to remove. You can usually use citrus household cleaners to soften the sap drippings and then remove them – just take caution that the cleaner is safe to use on your fence material. Vinyl and wood fence owners should be wary of the dangers of mold, moss, and algae, especially during the upcoming winter season. If this is not taken care of and cleaned promptly during the following spring, they can cause unsightly staining to your fence. This entry was posted on Friday, November 18th, 2016 at 3:36 pm. Both comments and pings are currently closed.